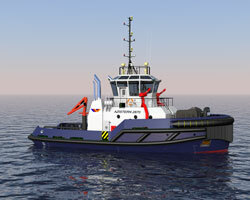 A new ‘off the shelf’ harbour tug concept developed by Offshore Ship Designers (OSD) promises to balance low wash and reduced fuel consumption with high bollard pull and multiple deck configurations.Dubbed the Azistern 2870, the vessel’s basic design is intended to shorten delivery times, freeing up the customer to focus on selecting the right deck options to meet their operational requirements. For instance, OSD says, potential deck features could include “a double drum forward towing winch with integrated horizontal anchor windlass and mooring warping heads; or a forward towing winch with separate vertical anchor windlass and capstan units”. The designer adds: “A double drum aft winch can be included in a semi-sheltered position, and the towing hook comes with multiple positioning options.” Alternative options include installation of: a stern roller; a deck crane, rated 1.8tonnes at 14m outreach; two firefighting monitors, each rated 1,200m³ (1.2 million litres) per hour; and a bow thruster. The Azistern 2870’s core dimensions include a length of 28.3m overall (or 27.45m, hull length), an overall breadth of 12.8m (12m, moulded) and a depth of 4.6m. The 390gt tug can accommodate between six and 10 persons and space has been provided for loose deck equipment, as well as deck store and rope store lockers. The Azistern 2870 can also store up to 110,000litres of fuel oil, 37,000litres of fresh water, 14,000litres of foam, 9,000litres of detergent and 3,800litres of lube oil. The boat’s draught is restricted to 3.6m (to the baseline) or 5.15m (to its moulded keel). With regards to power, the tug type has been developed to draw on a pair of 2,150kW engines, powering two fixed pitch azimuth thrusters, which, OSD estimates, will grant the boat a bollard pull of 70tonnes and a top speed of approximately 12tonnes. The vessel will also rely on a pair of 150kW auxiliary engines and carry two 12-person life rafts. OSD points out that the Azistern 2870 was conceived and constructed with a hard chine hull form, in order to limit wash, for the safety and convenience of nearby, smaller craft.